Buffalo Chicken Enchiladas, take one! 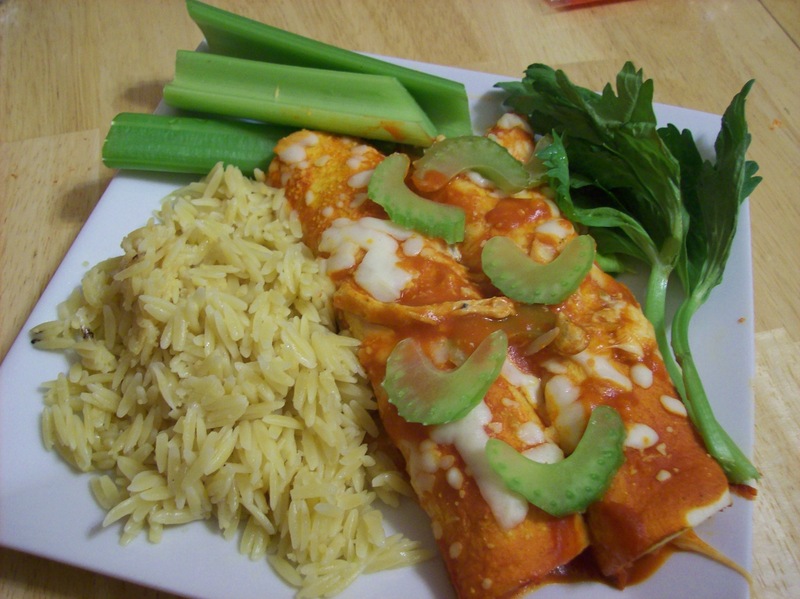 Yes, I said it: Buffalo Chicken Enchiladas…. yum! I stumbled upon this idea while eating some of these yummy enchiladas and thinking about these outrageously wonderful buffalo chicken egg rolls. 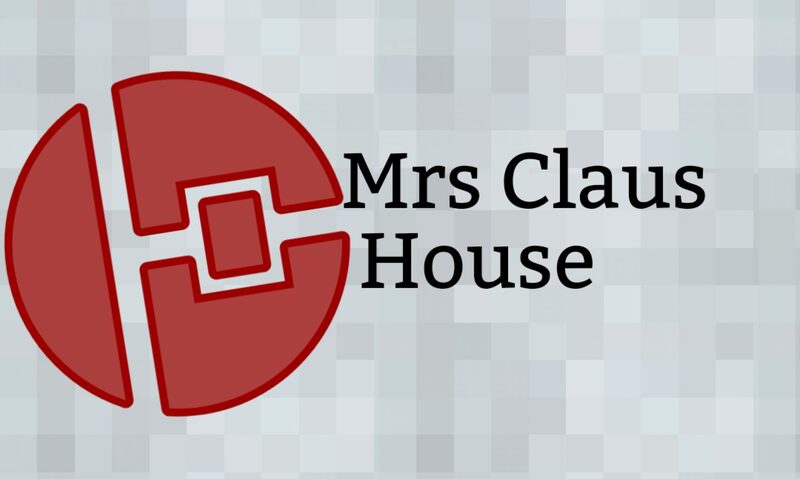 Thankfully, I had a personal vision about this because after googling last night to see if someone else has gone there, and what route they took I was sadly disappointed with the recipe I found! Mainly for the use of cream of chicken soup. Now, don’t get me wrong…. cream of chicken soup isn’t the devil. It has its place in the world and in many a casserole, but I just don’t see it here! Oh, and I forgot the chicken since it was already in the frying pan on the stove along with all these tasty ingredients! 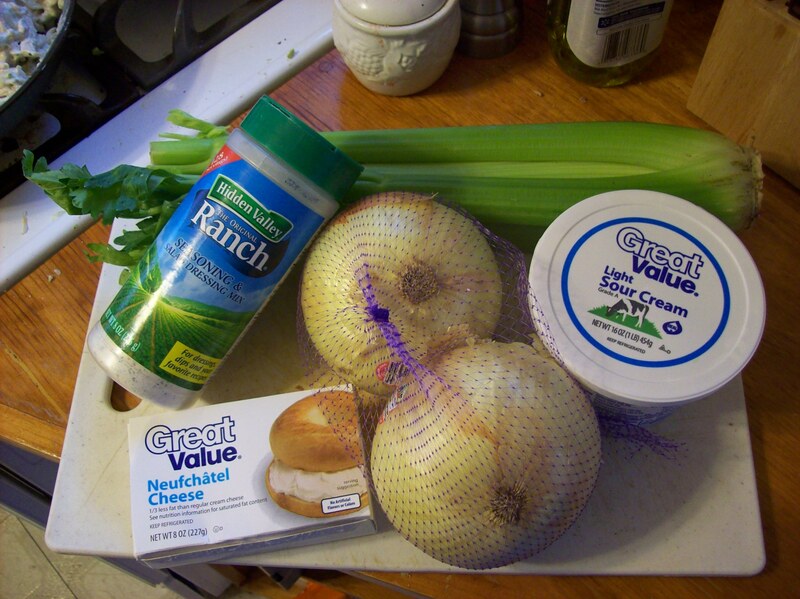 I used a couple of stalks of celery, about a quarter of one of those behemoth onions, a package of reduced fat cream cheese, about half a cup of light sour cream, and a packet or 3 tablespoons of ranch seasoning. Yes, ladies (and gentlemen?) That is a LARGE and in charge shaker of Ranch seasoning mix. It was misleadingly marked at Wal*Mart for 2.97. It was, in fact, actually 7.92. After disputing the matter, and being somewhat disgruntled, I decided that at nearly eight bucks, it was still a bargain, and I still WANTED it!!!! 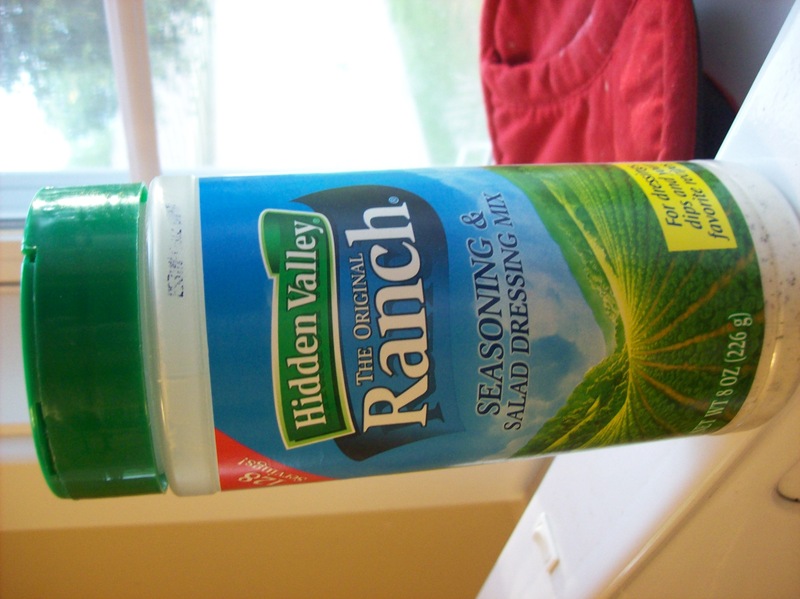 And, let me tell you: I have enjoyed my time with a bountiful supply of ranch seasoning! It goes on roasted potatoes, popcorn, eggs (yeah, I went there), and of course chicken. Moving on, bring in the Buffalo Sauce! For the sauce, I used a cup of tomato sauce, and a cup of Frank’s Red Hot, original. Now, if you are into spicy this proportion will work for you. 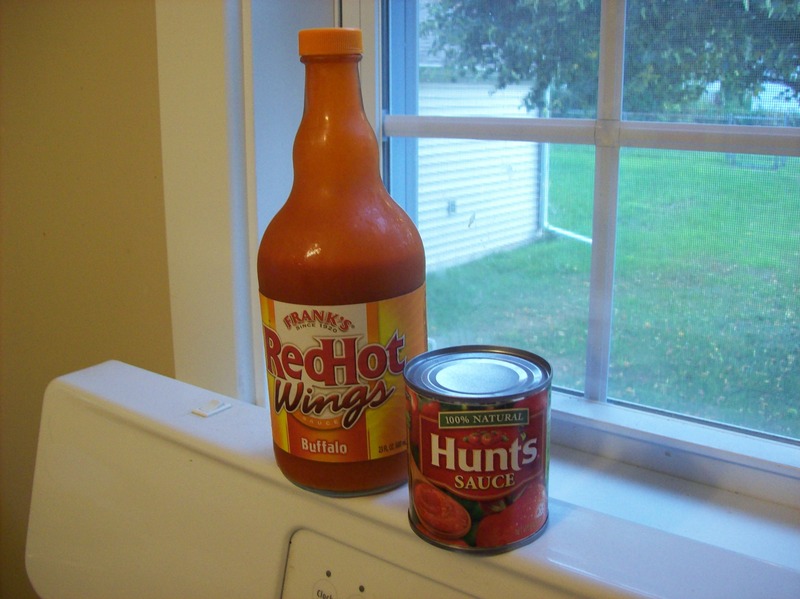 If you are not into spicy you might want to go 2 parts tomato sauce to one part frank’s. Begin assembly! 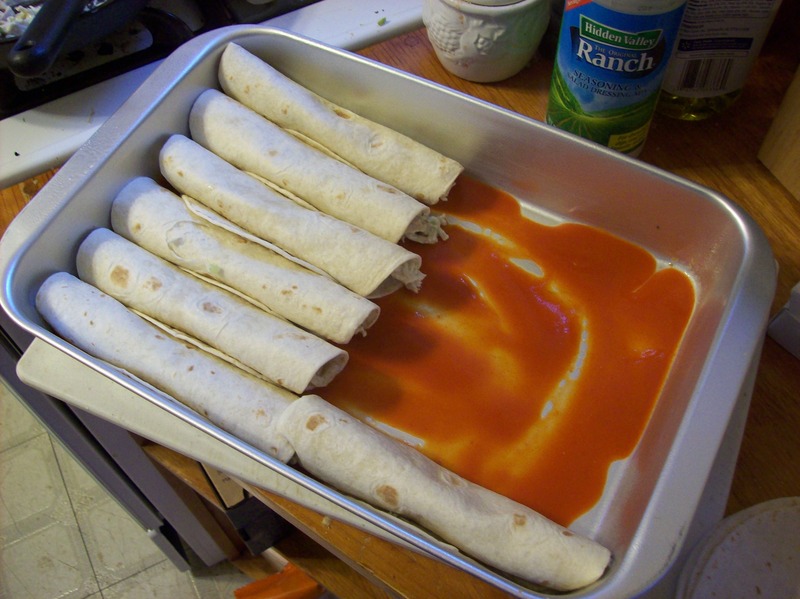 I spooned some sauce in the bottom of a greased 9×13, and began to fill my enchiladas. I ended up with about 12 of them 🙂 Then, covered with sauce, and cheese, and some celery slices, and baked at 375 for about 20 min. Oh, yum! Saute onion and celery til soft. Add cooked, shredded chicken and cream cheese. Cover and cook til cream cheese is melted, stirring occasionally. Add sour cream, and Ranch seasoning. Meanwhile, mix tomato sauce and Frank’s in a small bowl. Grease a 9×13 pan, spoon about 1/4 cup sauce into the pan, and distribute. Then, begin to fill tortillas with chicken mixture and place seam side down in pan. When assembly is complete, cover with remaining sauce, and sprinkle with cheese and celery slices. Bake at 375 degrees for 20 minutes, let rest five minutes before serving, and enjoy! These look SO awesome! Buffalo (and Ranch) ANYTHING always has a place in my kitchen!